Take a trip to the Balkans through the movies. The focus of many of the films from the former Yugoslavian countries are about the Balkan wars that broke-up the region. 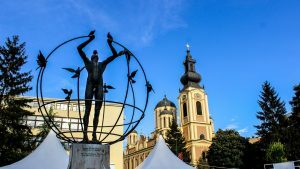 The events & subsequent effects of Balkan wars offer many perspectives and stories of what was occurring in Slovenia, Serbia, Bosnia & Herzegovina, Croatia, Montenegro, Macedonia, & Kosovo. Bosnia & Herzegovina, an undiscovered country in the Balkans, should be on your bucket list before it is “discovered”. With two UNESCO sites and another eight on the tentative list, there are more than a Top 10 of historical, cultural, and natural sites to see and experience. Transportation can sometimes feel overwhelming in foreign lands, but let me assure you that public transportation is available and mostly ease-free in Bosnia & Herzegovina. Here are the exact routes that I took on my journey. 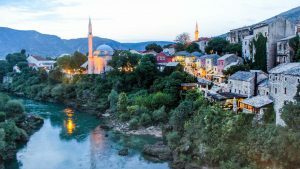 Mostar, a city at the crossroads of culture & religion of Muslim Bosniaks, Catholic Croats, and Serbian Orthodox has survived the power struggles and today is a magical village to explore in Bosnia & Herzegovina. 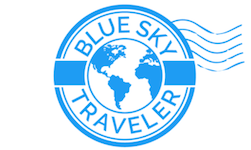 Copyright © 2019 Blue Sky Traveler LLC / All Rights Reserved.